If you’re a parent to twin toddlers, congratulations! You survived the baby years! You’re probably getting used to the fact that you have twins, and hopefully a bit more sleep. Unfortunately, raising twin toddlers is a whole new level of difficulty than newborn twins. There’s a new level of frustration that parents with one toddler experience and that level is double for twin parents. Don’t get me wrong, there is also twice as much joy, love, etc,, etc., etc…. toddler twins are just a lot of work and require a heck of a lot of mental strength. 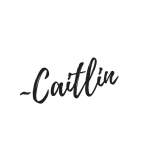 I have a post called “8 Ways Toddler Twins Are Harder Than Newborns.” I get email after email from frustrated twin moms after reading that post. Parents who feel like their kids are running their house. I get it. I feel like that many days at my house as well! But I know that as much as it sometimes FEELS as if my little twinnies are running the show, they actually aren’t. So, I wanted to write a post to help the mamas who are struggling with their toddler twins behavior. I’m not a perfect mom, and we have days of terrible behavior in our house, trust me! But I do have a few tips to share. There are certain aspects of parenting that are certainly easier with one child. That includes the toddler years! I say that from the perspective of first having had a singleton, and now raising twins. 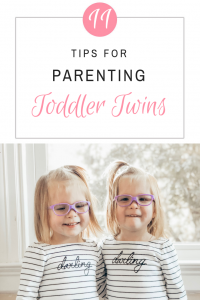 Whether you have twin girls or twin boys, the toddler years can be challenging. Having a solid and consistent routine is key. This doesn’t mean that you have to do the exact same thing every day. It simply means that your toddlers know what is expected of them and generally know what’s going to happen throughout the day. If you don’t have much going on and aren’t sure how to establish a routine, set one based on your eating and sleeping schedule. Anchor your bed and nap times, meal times, and have playtime in between those. What happens after dinner? Is it time to play or get ready for bed? Try to have the same routine every day. If they know that bedtime routine comes right after dinner, there is less of a chance that they’ll try to boycott bedtime. Nobody functions well on too little sleep, especially toddlers. Make sure you are doing everything you can to get them to bed at a reasonable hour and down for a decent nap. Our girls go to bed at 7:30 and their OK to Wake Clock (I HIGHLY recommend one if you don’t have it!) turns green at 8:00, which is when they’re allowed to get up. Their naptime is around 1:00-4:00. If you’re unsure what the concept is, read here about how to do independent playtime with twins. Honestly, independent playtime saves my sanity most days. My darling little twin toddlers just need a break from each other sometimes. They need the peace of not having to worry about someone taking their toys or getting in their space. I need it, they need it, we all need it. It’s especially important on days where one twin is sick and the other is healthy. On days that we skip independent playtime, I can tell a huge difference in their overall moods– they’re grumps! Yes, you. You know what’s best for your child, and so you have the final say. Oftentimes Toddlers don’t like this and can throw a big freaking fit if they don’t get what they want. Do not… I repeat, do not give in! I know it’s easier said than done when you have two little things screaming at you. I know it’s not always possible or appropriate to let your children throw a fit. You might have places to be, or be in a situation where it’s really not appropriate for them to be screaming and yelling. I also don’t let my children throw a fit to the point of being out of control. I think that it can be very scary for toddlers to get so upset that they can’t control themselves. When my children need my help to calm down, I always offer it. 100% of the time. However, when it IS appropriate, for example, they’re tantruming because they aren’t getting what they want, place them in their crib or another safe space and let them scream and yell. It’s important for them to learn that they can’t get whatever they want by screaming and yelling. 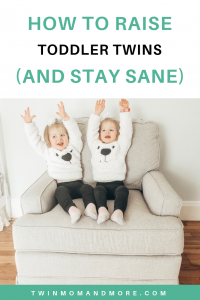 You can read more tips for how to handle tantrums with toddler twins <– in this post. This is my biggest struggle with my girls. Reinforcing the rules takes everything out of me because there are TWO of them and they test me quite a bit. It’s tempting to let them get away with things here and there and I have to remind myself that it’s easier to reinforce the rules with a 2-year-old than a 12-year-old. Not only will standing strong make life easier on me, but it’s raising them to be respectful and responsible. How to Reinforce the Rules?? My other biggest struggle with reinforcing the rules is that it often feels like it isn’t working. Sometimes they just don’t care about the consequence or discipline doesn’t seem to work. Example: Josie takes a toy from Margo and runs in circles around her laughing, before leaping up onto the couch and throwing it behind. (This happens multiple times a day, in case you were wondering.) We get the toy, Josie gives it back to Margo, says sorry, we talk about how it isn’t kind to take things and it’s against the rules. I tell her if she can’t play nicely, she will lose the privilege of playing with her sister and have to go play in her room by herself. It’s a perfectly logical consequence. Literally a nanosecond later, Josie will repeat the same behavior. I then explain that since she isn’t being kind and is antagonizing her sister (OK, I don’t use this word with her!) that she has to go upstairs to her room. I then have to carry her kicking and screaming upstairs because she wants to stay with her sister. After she comes out of her room, she will most likely repeat the same behavior. I want to pull my hair out because it feels like nothing I’m doing is working. Mamas, this is normal. I know this is developmentally appropriate for toddlers. They push the boundaries because they want to know what they can get away with. They are checking to see if we really mean what we say. Josie wants to know if she can take toys from her sister once she’s served her time in her room. Being a toddler is hard. There are so many rules to follow and they aren’t yet able to manage their emotions. Sometimes all they need is to be heard and have their feelings validated. I mean, this isn’t going to stop bad behavior, but it’s a step. Fake it ’till you make it! There will be moments when your toddler twins drive you crazy but you have to do your best to keep your words and attitude positive. Our children pick up on everything. Here are my tips for staying calm as a mom. Just keep at it. There will be both good days and bad days. I truly believe that if you remain consistent that you can have order and prevent your toddler twins from running your house! I hope this post gives you some ideas to think about and doesn’t make you feel judged in any way. 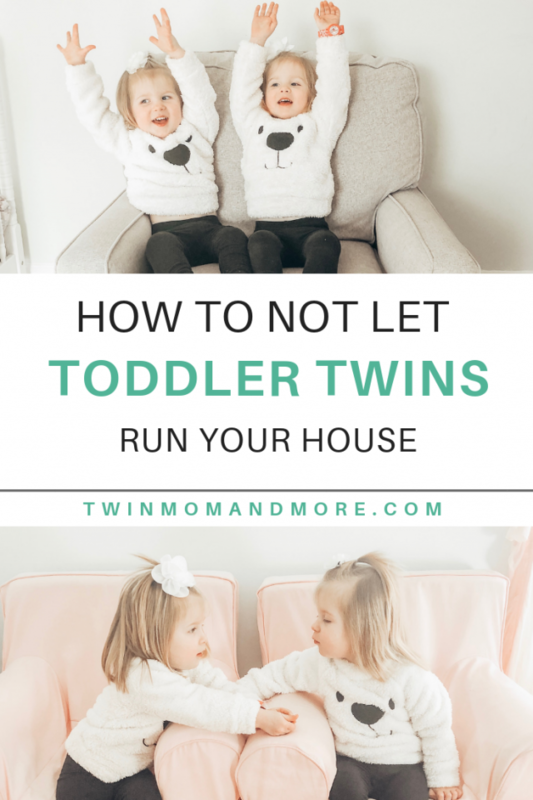 You are doing a wonderful job parenting your toddler twins… just don’t let them run your house! Please let me know if I can encourage or support you in any way through this journey of toddler twindom.